Many online payday loan lenders today offer a no faxing payday loan application process. Generally, this means that consumers do not have to fax in any documents to apply and qualify for payday loans. Even so, it’s important to understand how lenders that offer a no faxing payday loan application process can determine if a consumer qualifies for a loan. This will keep you aware of information lenders may acquire about you even if you do not submit any verification documents to a lender directly. What Do Payday Lenders Look At to Determine If An Applicant Qualifies for A Loan? The five key areas that payday direct lenders will typically look at to determine if a consumer qualifies for a payday loan include proof of identification, state residency, employment, and existence of a checking account, sometimes with direct deposit, under the consumer’s name. Typically, in-store payday lenders are able to verify this information by looking at a consumer’s government issued state ID/license, a bank statement, and a pay stub. For some online lenders, consumers are required to scan or fax copies of these documents. 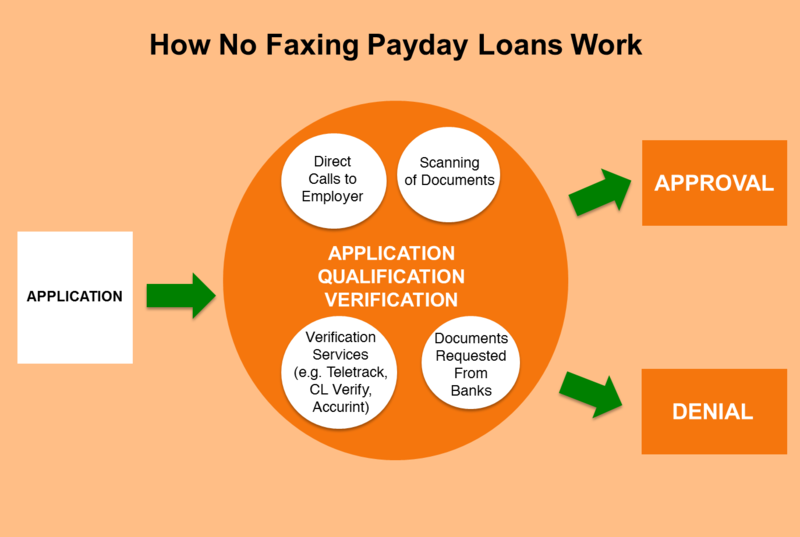 How Do No Faxing Payday Lenders Verify Applicant’s Information? Faxless payday loan lenders use a number of other methods to verify your information. Some, rather than have you fax any documents, will require you to put a request with your bank to provide a bank statement to the lender. Some will call your employer to determine if you are indeed employed by the employer you listed on your application. Some payday lenders use independent verification services like Accurint, CL Verify, or Corelogic/Teletrack. These services may provide identity verification, bank account validation, employment history, and information on your open and paid payday loan performance history, open and paid charge-offs, bankruptcy filings, and more. With these verification services, online payday direct lenders are able to bypass the entire faxing of documents by consumers completely. Can No Faxing Payday Lenders Still Ask For Verification Documents? A careful look at the fine prints of online payday lenders will show that depending on state laws and qualification criteria, lenders may still require consumers to provide verification documents. Always ensure that the information you put down on an application is accurate to avoid as much as possible the hassle of providing verification documents. In addition to our payday loan application which is a faxless system, some of our most popular direct payday lenders also offer no faxing payday loans including CashNetUSA, Ace Cash Advance, and Check City.